Preheat grill or broiler. 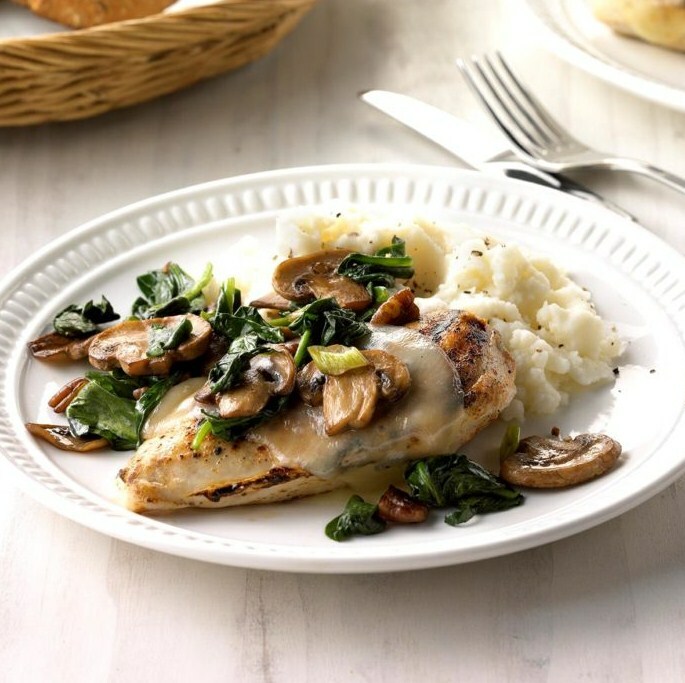 In a large skillet, heat oil over medium-high heat; saute mushrooms and green onions until tender. Stir in spinach and pecans until spinach is wilted. Remove from heat; keep warm. Sprinkle chicken with seasoning. Grill, covered, on an oiled grill rack over medium heat or broil 4 in. from heat on a greased broiler pan until a thermometer reads 165°, 4-5 minutes per side. Top with cheese; grill or broil until cheese is melted. To serve, top with mushroom mixture. Health Tip: This low-carb main dish is also gluten-free. 1 serving: 203 calories, 9g fat (2g saturated fat), 68mg cholesterol, 210mg sodium, 3g carbohydrate (1g sugars, 2g fiber), 27g protein. Diabetic Exchanges: 3 lean meat, 1 vegetable, 1 fat.